I’m thinking about changing my blog around a lot. Maybe even switching to a different blog host….we’ll see. I’ll keep anyone who might be reading posted. I had a bad migraine yesterday and had to leave work early. I haven’t had one in a while. Maybe it’s the new climate of NC and changing seasons or something. Oh well. I ended up coming home in the afternoon and sleeping for quite a while. I woke up and my wonderful hubby had made us some dinner and was doing the laundry I started. He was so sweet and just let me sleep it off. I didn’t see any of the election stuff last night. And I don’t feel like I missed too much, because they’re already replaying all the speeches and everything on CNN at work. When the husband woke me up in the morning, he said that almost all of the people we voted for had lost. 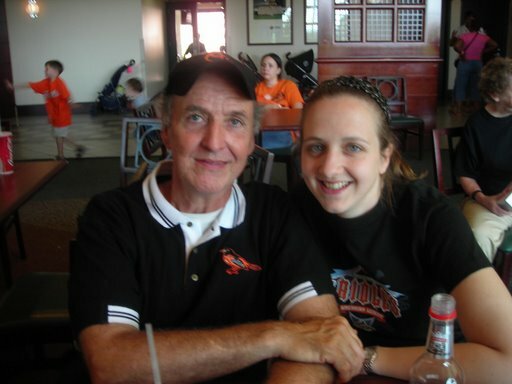 I told him that wasn’t anything new for me, since I moved here from Maryland and was always in the minority there too. Oh well. I just hope and pray that our new leaders will lead our country and our state well. and I’m not going out to vote today. Andy and I actually already did. We took advantage of North Carolina’s early voting and went out to vote two weeks ago. I’m so glad that we don’t have to deal with the craziness of rushing around to try and vote today. NC made it nice and easy. I’m thankful that we had the opprotunity to vote, but will be very relieved when today is over. We have CNN on all day at work and this whole election season has been soooo long! I hate the end when candidates start backbiting and picking on each other. I’m just praying for our country and it’s future in this uncertain time. Posted by abi in art, life. is our 2 month wedding anniversary. I’ve been married 2 months. Crazy. I’ve finally gotten over the surreal feeling and I feel like we’ve settled in. Settled into our life together, routines, work, and dealing with the daily frustrations of life. And I’m really enjoying it. I’m still a little lonely, as I haven’t made many friends down here yet and I miss friends and family up in Baltimore. We’ve visited Andy’s family several weekends though and that has been a lot of fun. They have been great and I’ve had fun going out with Andy’s stepmother, his sister, and stepsister for some much needed girl time. Here is a painting that I started last Sunday and finished just a few days ago (so I’m going to say it still counts). It’s one of the larger paintings I’ve ever done – about 24″x36″. I got the canvas on sale years ago and was glad to pull it out to try and brighten up our white walls. It was a lot of fun to do – try and get in a lot of colors already in our living room and pull in some others so that I have options to redecorate around too. I used acrylic paint – not my usual oil paints. This prayer was part of one of our devotions on the mission trip last week. It has stuck with me and I want to memorize it. I feel like I’m definitely being disturbed lately by all that is going, but I still need the reminder. And I need the reminder right now to trust in my Captain. Posted by abi in life, wedding. Last weekend was a busy one! Friday night I went to watch my little brother play one of his championship little league games with my family. It was a good game – really close and Andrew got on base several times, stole a base, and scored a run for his team. Then I took my other brother, Patrick shopping for new clothes – he hadn’t been shopping in several years and ended up with pretty much a whole new wardrobe. 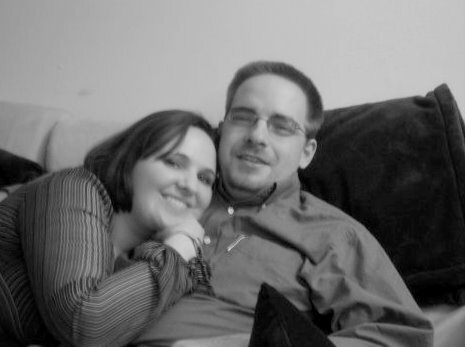 His fiance’ is excited to see him in new clothes when we go up to Boston the week before his wedding. On Saturday, my sister Katie and I went down to Hampden for the annual “Honfest”. HonFest is a local tradition. The Bawlmer term of endearment, Hon, short for Honey, embodies the warmth and affection bestowed upon our neighbors and visitors alike by historic working-women of Baltimore. HonFest is an annual celebration in honor of these women. Since 1994, HonFest has grown from a tiny Baltimore’s Best Hon pageant behind Café Hon, to a nationally recognized festival that covers four city blocks on Hampden’s very own 36th Street. In recent years, the festival has been acknowledged by The New York Times, Rachel Ray’s Tasty Travels, Nightly News with Brian Williams, The New York Post, Southern Living, The LA Times, HGTV, CNN, and just this April by The New Yorker. That evening I had a good time with my family and especially enjoyed visiting with my Aunt Trish who came all the way up from southern Virginia (about 7 hours drive) to spend the weekend with us and go to my shower. 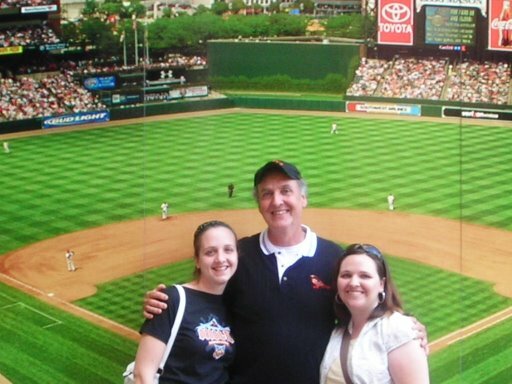 On Sunday, my sister Emily and I took my dad to the ball game! It was Emily’s idea – and we had a great time! She wanted to get nice seats for him, so we ended up trying out the “All you can eat” box seats. I had never done box seats before – they were really nice! Part of the deal was that we got our hands stamped and then could go out and hot dogs, nachos, popcorn, peanuts, ice cream, soda and lemonade whenever we wanted. It was a close game between the Orioles and the Pirates….but the Pirates won it in the 10th inning. We really enjoyed spending the time with our dad and I really appreciate the great example of a caring, Godly man that he has always been to me. 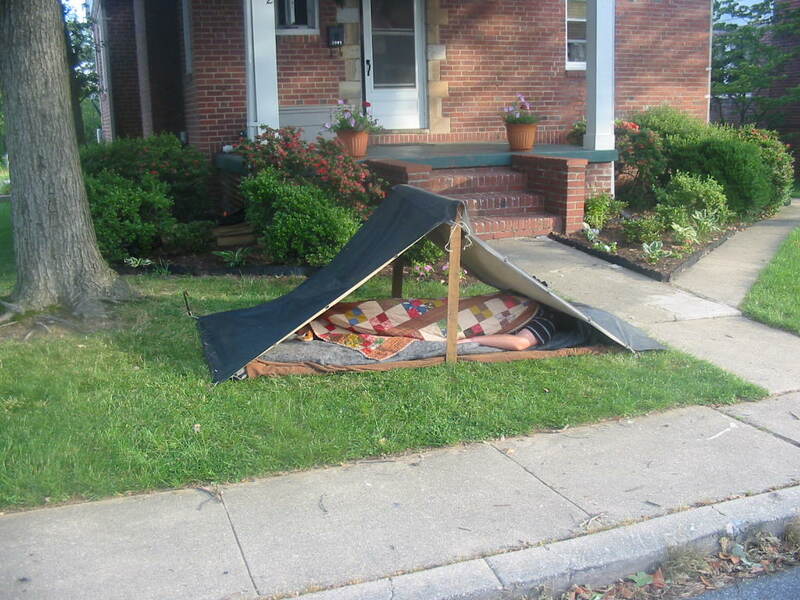 My little brother Andrew kept himself busy while we were gone….he made a tent in the front yerd! 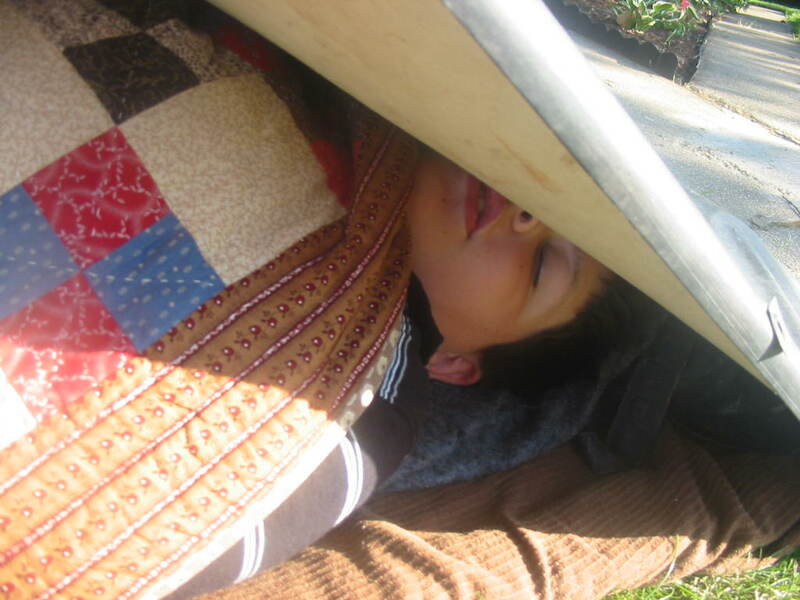 He ended up sleeping out in it all night and I took these pictures of him before I left for work on Monday morning. So I went home early a few nights last week and slept, and I got to sleep in on Saturday (a rare treat these days), but I still don’t feel caught up. Oh well. I’ve got way too much going on, as usual for the next few months – nearly every weekend is accounted for already. And I’m trying to wedding plan and visit with a lot of people up here since I’ll be moving away at the end of the summer! Crazy times. I created a wedding website to help keep all of our family and friends up to date on any wedding related info and let them get to know us a little better. I just added a blog there too and will try to update that blog every week or so. wow – it has been forever since I’ve put anything up on this site. I have been pretty busy with a little bit of everything. Youth group stuff is going well – we had an incredible time with our 30-hour Famine. I was very impressed with the 20 middle and high school students who gave it a try and for the first time in most of their lives, voluntarily went without food for 30 hours to raise awareness, money, and canned goods for the many, many people around the world and here close to home who go hungry everyday. It was a really neat thing to see them so motivated to let other people at our church know about all they had learned about hunger. But my biggest news is……. Andy and I got engaged! We had been thinking seriously and praying about the idea of marriage for the month or so before, especially since we found out he was moving away. We took my parents out to dinner the day after Valentine’s day and talked to them about it and Andy asked for their permission to marry me. So I knew it was coming….but he was really cute – we had a free Saturday afternoon and he wanted to go to the inner harbor again before he left town. We walked around (it was a little windy and cold) and then we went up to the the “top of the world” (Baltimore’s World Trade Center – which the guide told us was the tallest 5 sided building in the country or the world? I can’t remember, but something like that). We were looking around when all of a sudden I turned around and Andy was on one knee! He asked, I accepted, and we’re both really excited about the future together! 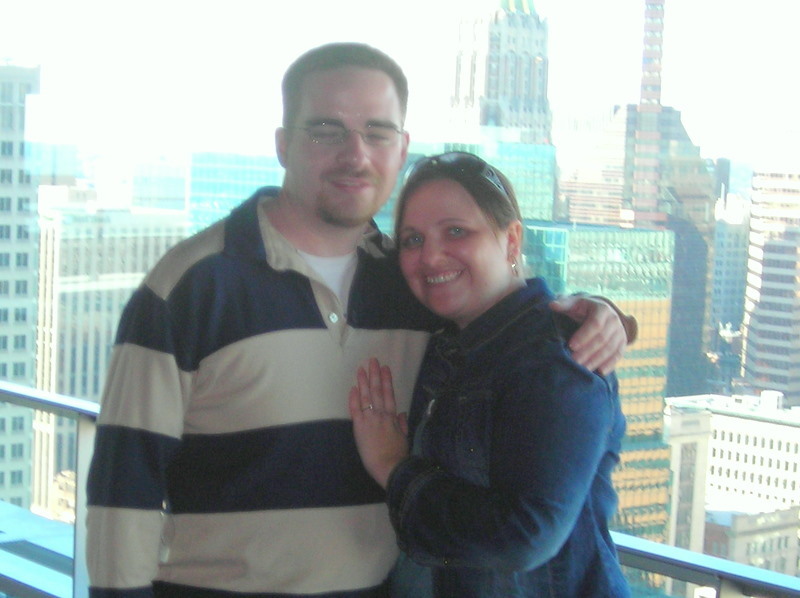 We were already planning to go visit with some friends that night, so we had a great time showing off the ring and sharing our excitement with everyone. it was the boyfriend’s birthday a few week’s ago and we had a lot of fun celebrating at a Japanese steakhouse. We invited my sister and her husband to go with us because, interestingly enough, boyfriend and brother-in-law get along really well and he wanted them there. Neither Emily or I had ever been to a Japanese steakhouse before and enjoyed the showmanship of the chefs and the fresh food cooked in front of us. My sister had us over to their apartment for cake and ice cream afterwards (a surprise to boyfriend) which was really sweet of her, and we watched the movie Office Space. After issues with the church and the conference he was with, boyfriend decided he needed a break from the ministry for a little while and he has been pursuing other career opportunities. He was has been pretty excited about a possible job with the Red Cross where he would be stationed on military bases, first here in the US for a couple of years, then anywhere after that helping the soldiers as an assistant station manager. He found out he got the job last week and was waiting for the final offer in the mail to find out where they were sending him. I was hoping it would be somewhere nice and local to this area…like Quantico or Ft. Meade…but apparently he’s heading down to a base in North Carolina. Which is kind of good for him since he’s from there…..I just don’t like long distance relationships. Oh well. We’ll see where this whole thing goes. I’m really happy for him about the job though – it seems like a really good fit and something he’s excited to be doing.